This sample of sand is from a strandline on a beach of the Columbia River and was collected 708 miles from the mouth of the river. It contains a grain of garnet (lower center), hornblend (middle right), numerous opaque grains (mostly magnetite and related iron rich oxides), and other minerals. The concentration of heavy minerals in this sample indicated that heavy materials, including smelter slag should have been concentrated at this site. This field of view contains no smelter slag. Circular polarized light causes all paricles in the field of view to exhibit the maximum intensity of the interference color for that particle in that azimith of its optic axis or bisecatrix. Reflected darkfield illumination highlights reflective surfaces or optically heterogeneous materials or surfaces. Particles that scatter light because of their heterogenaity tend to take on an orange cast (the third particle from the bottom on the left side). 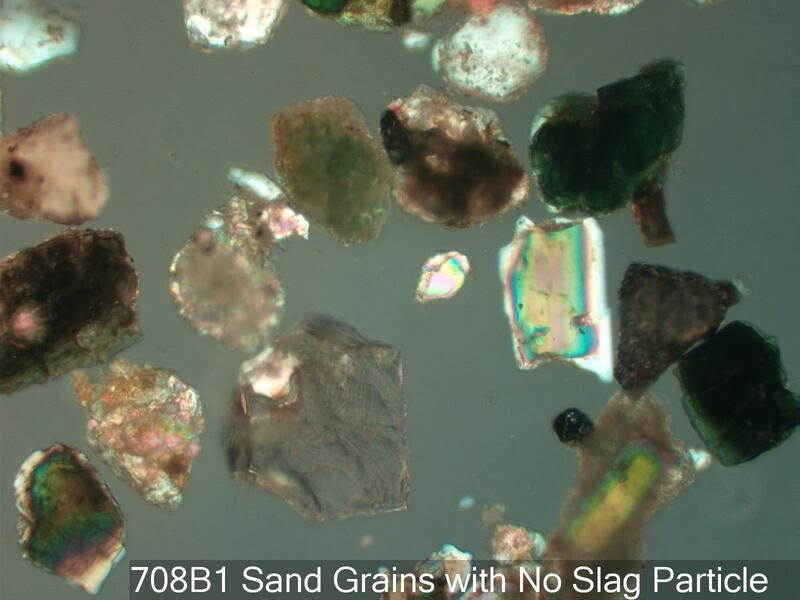 Particles that specularly reflect light tend to be bright if the angle is correct, such as the highlights on the small black particle above the "S" in Slag. This is a zone in which smelter slag should be found if the slag particles were about this size and were present at this position on the beach.